History: 56 year old man with new onset 12 hour history of abdominal pain, nausea and vomiting. 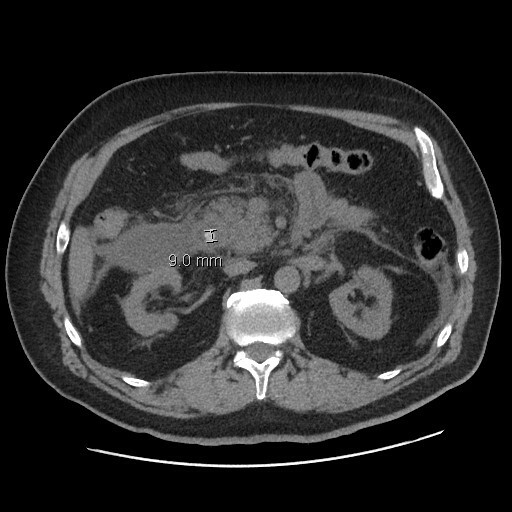 Gallstone Pancreatitis: Single axial CT scan of the abdomen without contrast shows significant peripancreatic fat stranding, more conspicuous at the head of the pancreas, and worrisome for acute pancreatitis. 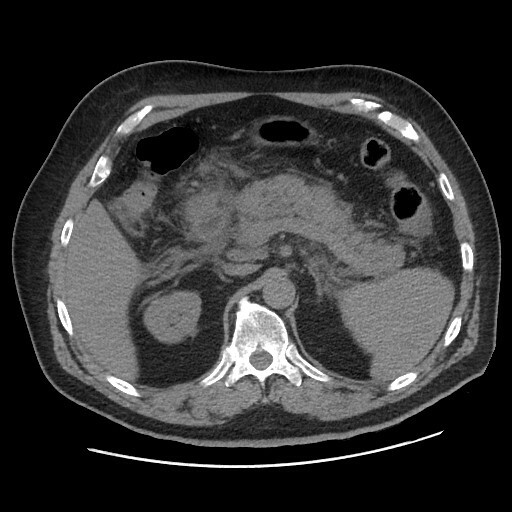 Gallstone Pancreatitis: Single axial CT scan of the abdomen without contrast in the same patient shows an obstructing calcified gallstone in the distal common bile duct, indicating the etiology is gallstone pancreatitis. This patient went on to endoscopic retrograde cholangiopancreatography (ERCP) and was found to have a large obstructing gallstone in the distal common bile duct. Sphincterotomy was performed, which is a common method of treatment for gallstone pancreatitis and choledocholithiasis.